Many economists project a slow recovery from this recession, as consumer spending, which makes up more than two thirds of the economy, is not expected to rebound any time soon. On what basis are economists making these projections? Mounting job losses are a major reason why consumer spending is not expected to be strong, and serves as a risk to the economy going forward as we discussed here. Another reason is that consumers have started to reduce their debt levels (i.e. rather than spending, they are saving). Clearly, consumer debt levels are quite elevated in a historical context, despite the recent well-publicized reductions. This indicates that there could be more debt reductions in store, which would further reduce the consumer's ability to spend. 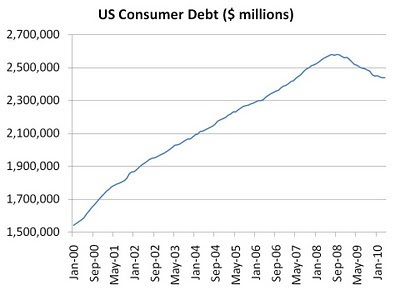 Will consumer debt return to the levels that they were in the year 2000, when the last recession took place? Nobody really knows. Furthermore, it's important to note that much of the consumer debt burden (which is on the decline) has been shifted to governments. As governments will be forced to cut back (which is starting to occur now in Europe) in order to reduce debt levels, this will further hurt economic growth as funds are pulled out of the economy for the purpose of debt reduction. Investors bullish on the stock market should keep these figures in mind. Revenue growth will be hard to come by for many public companies. For most, profit growth will have to come from cost containment and productivity growth. Companies with flexible cost structures may be in the best position to see their earnings grow.